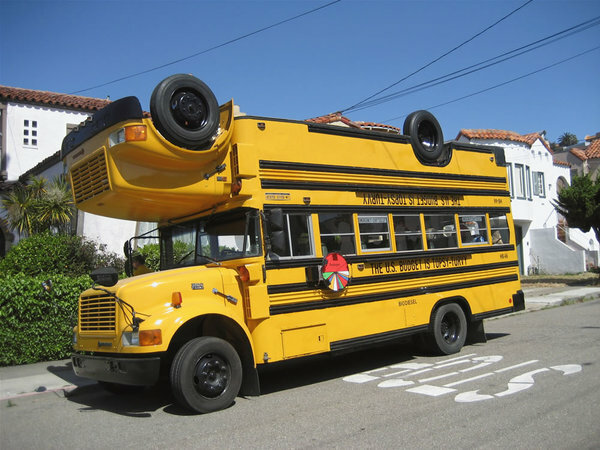 I came across this odd photo of a school bus in Google Images and felt like it was fairly representative of life during these past months . . . completely impossible to figure out which end should be up. For the past few months, I’ve been following my mother’s admonition: if you don’t have something good to say, don’t say anything at all. To assert that the printing business has changed is not just an understatement, it’s an offense against the obvious. It would be lovely to offer that we’ve charted a new course and are off to grand adventures with a revitalized business. Alas, that is not reality. We have tried about everything with our little business in our little town, and very little has worked. Today, we are struggling with a very small staff, battling deteriorating volumes and prices, losing lots of money, and praying for miracles. The topsy-turvy bus is actually a good image for this post and these times. The idealism of past years could be represented by the upside-down wheels on top. We’re still driving the bottom half, which is anchored to the ground by gravity; but I’m wondering how long the tires and the engine will hold out. You are currently browsing the Poor Richard's Printshop blog archives for March, 2012.